Our Detailers are determined to make your vehicle look and feel like new again. Our Detailers are trained to help you protect your investment by maintaining factory finish of both the interior and exterior. 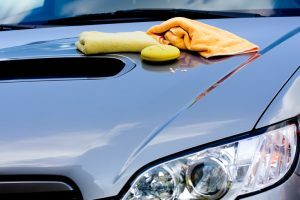 Whether you are getting ready to sell or trade-in, give it to a loved one or just need a deep down cleaning, let one of our professional Detailers take a look. It is important to note that we service vehicles of all sizes and all conditions so service times and prices are only an estimate. The detailer and location manager will give you a more specific estimate so you can better plan your day and your budget. Deep clean of jambs, cracks, door pockets, ashtrays, glove box and crevices. Shampoo of all carpets, mats and cloth seats. All leather is cleaned, conditioned and treated. Plastic and vinyl is cleaned and dressed. This service is truly an excellent gift for parents with kids, those who travel frequently for work or those stuck in traffic. Also highly recommended for any potential sale of the vehicle or with the purchase of a used vehicle. Estimated Time: 1.5-2.5 hours pending average condition of interior. Biozym cleaning is an enzyme based cleaner that attacks organic material in the vehicle. The treatment continues to work days after the detail. Highly recommended for allergies, vehicles that shuttle small children, etc. The Deodorizer treatment includes extensive steps to clean and eliminate unwanted odors or fragrances. The process includes cleaning at the source of problem followed by a further treatment to vents and airducts. Vehicles with extreme odors associated with smoke, skunks, milk, smelly teenagers, etc. Please note that some odors can find ways to embed themselves into the padding of a vehicle’s interior and are unable to serviced by White Horse. Bodyshops and other vendors can help to remove/replace padding if necessary. Our philosophy is start with the least expensive option, and do more as the problem requires. Meant to restore and maintain the showroom finish. Basic wash followed by clay bar removal of surface contaminants. Polish & wax with orbital buffer. Paint sealant applied by hand. Exterior trim treated with polymer sealant to revive faded plastic. Wheels cleaned & tires dressed. 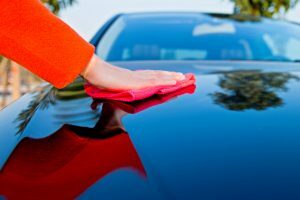 Darker colored cars are recommended to consider upgrading to the Compound service as surface scratches are more visible with darker colors. Excellent way to maintain the vehicle. Our Basic Exterior Detail includes polymer based polishing wax that is in a liquid format. It does an excellent job on most vehicles. Our Paste Wax is even better. This product is in a solid format and is loaded with pure Brazilian Carnauba, which is only grown in the northeastern Brazilian states of Piaui, Ceara and Rio Grande Norte. The wax adheres to paint and creates an excellent bond, which can help to create a shield of protection that can last up to 3-4 months longer than the wax used on our Basic Exterior Detail. Compounding the vehicle adds a 5th step to the process used to restore and maintain the painted surface. 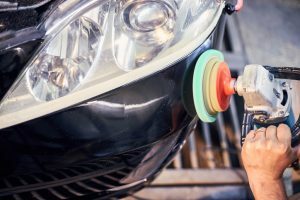 Compounding is the process by which a gritty liquid based solution is applied gently to the paint to smooth out existing surface or clear coat scratches. Often visible scratches are simply the light reflecting off inconsistencies in the paint and not a complete loss of paint. Compounding helps to smooth out the painted surface for a more brilliant shine and helps to restore the surface to its original resilience. White Horse does not use high-speed, single direction buffer at our locations, which can easily lead to hologram and uneven surfaces if used by an untrained detailer. Our compound is applied with a dual action buffer that allows for enough action for surfaces scratches to be removed without the high degree of risk associated with high speed buffers. Includes both our Base Exterior Detail and the Interior Detail services described above. The price is designed to offer our customers a discount for opting for the bumper-to-bumper service. This is an excellent way to restore your vehicle to as close to new condition as possible, and highly recommended for those who intend to sell, trade-in or gift a vehicle. Excellent gift for Mom, Dad, Co-worker, Commuter, Graduate, First Job (or interview), First Date, etc. NOTE: All services require a detailer to inspect the vehicle for accurate timing and pricing. Pricing is based on the size and condition of the vehicle. Medium: covertibles, sedans, small hatchbacks, etc.